About 10 or 11 years ago, I helped some people to make contacts with colleagues in Wycliffe Bible Translators. These people, in N. Ireland and Bosnia, set out on a dream. Yesterday I held the fruit of that dream in my hands. Back then, linguistic wisdom declared that Bosnians, Serbs and Croats could all understand the Bible in Serbo-Croat. Even today, The Ethnologue references to Bosnian, Serbian and Croatian all state – Bible: 1804–1968. In other words, there was a Bible developed over that time span that is mutually understandable to all three language groups. However the Bosnian conflict of the 1990s, and the subsequent independence of Bosnia-Herzegovina, has resulted in a nationalisation of all three languages. While linguistically, there was no pressing reason for a translation of the Bible into Bosnian, there were very strong socio-linguistic reasons for doing so. Bosnian Christians, with clear memories of Serbian war crimes, wanted a Bible of their own. 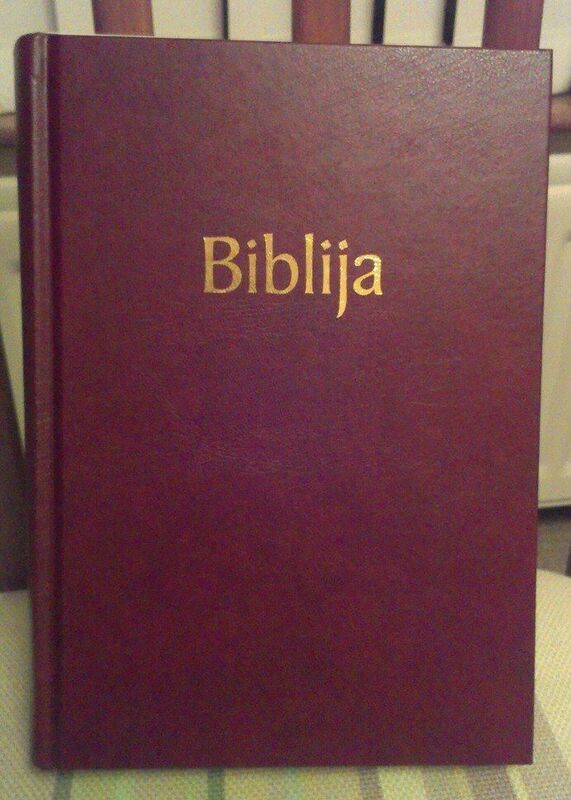 The Bible in modern Bosnian is now complete. The translation was done by a group of Bosniak scholars in Sarajevo with supervision from an experienced Bible translator. Last Friday I went to the Europa Hotel in Belfast, not to met Richard Haass and his team, but to catch up with two men who were instrumental in raising funds in N. Ireland to finance the project. It is our prayer that God Almighty would speak through the pages of this translation and bless everyone who reads it, whatever religion they belong to. And that’s how I now have the Bosnian Bible that you see in the photo above. Is this bible translation available for sale online somewhere? I am from North Carolina and have been searching for this for quite a while. I have passed you message on to someone who will be in touch. Please, John, i am not sure i am doing this correctly, but i too am trying to get some friends a Bible in Bosian. Thank you. I too want to know where I can get a copy of the Bosnian Bible. I need to get a copy to give it as a gift to a Bosnian friend. It would be a beautiful thing if you could get in touch with Bible.Is to have the Bosnian language included in this website. Congratulations on this so needed wonderful Bible project. I have passed your message on to someone who will be in touch. If this Bible is available for sale, it would be a huge answer to prayer. We have Bosnian friends that escaped the war in the 90’s and came to the US as refugees. I would love to be able to give them a Bible in their own language. Could you let me know where to find it? I have passed this on to someone who can help you. I also would like to purchase a Bosnian Bible. I have a friend from Bosnia who I have shared Scripture with, but I think it would be so much easier for him to not only have his own Bible, but one in his language. I really want to give it as a Christmas gift. Please pass my information on to someone who can help me. I have passed your message on to someone who will be able to help you. Hi Steven! I have passed your message on to someone who will be able to help you. Hopefully it can be organised by Christmas. Postage is a problem, I believe. The Bosnian Bible is a weighty book, but my friends can advise. I wanted to clarify with my friend… he does read Bosnian. Will your friends be calling me or contacting me through email?? Thanks John! I would really like to get a copy of the bible in Bosnian for my wife as a gift. Bosnian is her native language. Please help! Thank you, Jon, for your message. Please send me an e-mail address and I can put you in touch with the right person to help you. I would also love a copy of the Bosnian Bible! I’m originally from Bosnia and was saved at the age of 18. My family aren’t Believers but I have spoken to them about the Lord Jesus and continue to pray for them and the Bosnian people. Hi Anita! Great to hear your story. If you send me your e-mail address, I can pass it on to someone who can help you get a Bosnian Bible. Hi John, can you pass on my request for a Bosnian bible as well? I appreciate your help! Thank you for the work that you do. I as well would like information on purchasing a Bosnian Bible. God Bless you. It’s great so many people want this Bible. I would like to buy one as well for a Bosnian co-worker. My email is andrew_moore1@hotmail.com. THanks! Andrew, I’ll be in touch next week re your request for a Bosnian Bible. Hi John, I’m doing a seminary project on the unreached people group of Bosniaks. I would love more information on how the translation of the Bible into Bosnian transpired, who did the work and how long it took. I would also love contact info for people looking to purchase a Bosnian Bible. Please e-mail me at Dmanofgod1@yahoo.com. Hey thanks for the news. I work with Bosnians and am learning the language. Could I buy a few copies? Tell me some more about your work. Let me have your e-mail address and I can put you in touch with sopmeone who can supply Bosnian Bibles for you. Can I please have a Bosnian Bible? I have a relative who reads and speaks Boznian and I would love to give them one. Please email me as to how I could acquire this! Please respond with your e-mail address and I can put you in touch. I have a friend from Bosnia whom I would like to purchase a Bosnian Bible for. Can you please help me? I’d like to buy a Bosnian Bible for friend. I need a Bosnian bible for a co worker who is interested in spiritual renewal. Please send me the information for purchase. Thank you for all you do. Robin, I’d be delighted to do so. However it would help to know more about you especially since you e-mail address seems to bear little relevance to your name. Is it a catholic bible or Protestant? Please send me email with more information as I am interested to purchase a bible for my husband. I have just e-mailed you. I am interested in getting a Bosnian Bible for a co-worker. I did not know they were so hard to come by, your article is very insightful. Please email information about how I can get one. I have a friend who needs a Bosnian Bible. Please tell me how I can purchase one.